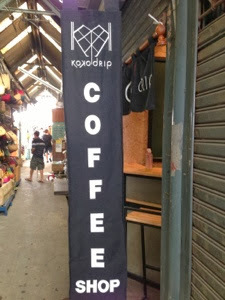 In the Art section of the Market; N introduced us to Koko Drip, a great little Artisan Coffee, Cocoa and Thai Tea shop. 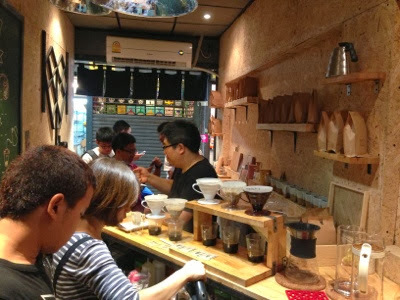 Koko Drip is a real intimate affair; a small booth like space, with a counter top bar arrangement to provide punters with their Caffeine fix. 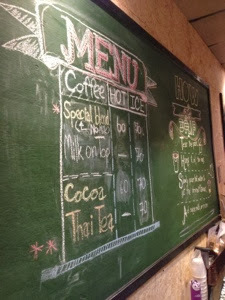 The 2 staff members were very friendly and more than happy to tell the story of their great beverages. The Coffee beans themselves are grown and bought in from Chiang Mai. I was very happy to know it was sourced within Thailand. 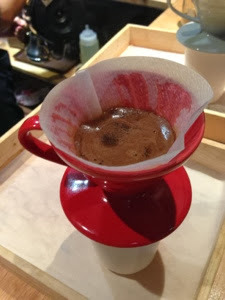 The Beans are actually roasted by Koko Drip before being ground and sold. They don't rush the coffee making process either; as it goes through the drip, you can smell the aroma waffling from the brew. 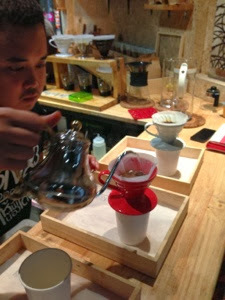 They place a filter into the drip funnel, put in the freshly ground Beans then slowly pour in hot Water. When it drips through completely, they top it up again to ensure a full cup. You can have the Coffee black or with a dash of Milk. The Coffee is very "light" in taste and gentle on the tastebuds. It isn't meant to provide a huge flavour kick but more an experience that you can enjoy. If you add Milk, it gives a very nice creamy texture that does enhance the taste further if you like the smoothness of dairy. If you like iced versions of the drinks, they do make some fancy foam for you. The foam is "churned" and made manually. 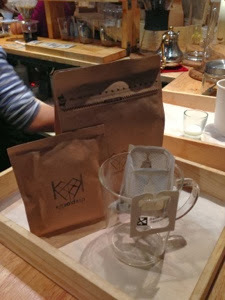 The cool filter drip bag design also means it sits on top of your Coffee Mug perfectly. 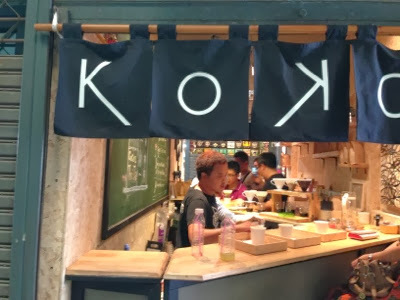 Koko Drip is a great way to fuel up before wondering around the huge Chatuchak Market. It certainly hits the spot and kept us powering through until lunch. 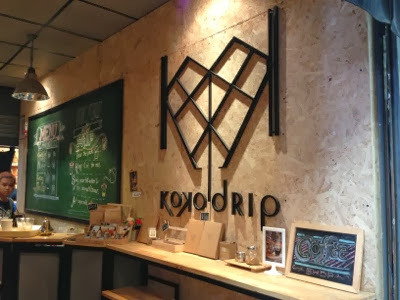 The Art quarter; in area 7, where Koko Drip is located is also worth exploring. There are many talented Artists who have their works on display. Do you need your daily Coffee hit before starting the day?